What is the velocity on this ammo? BEST ANSWER: You could probably go to their website and they would have the ballistics. I don't have a chronograph so I can't really say. does the bullet in this ammo have a complete metal jacket or an exposed lead base ? In the proper sense of the verb "to know," I can't answer because I've never pulled a bullet to see. But, my understanding is that a "full metal jacket" (FMJ) bullet is completely encased, and a "total metal jacket" (TMJ) has the base exposed. The “FMJ” on the box stands for Full Metal Jacket. So yes, these rounds have a metal jacket. It clearly states FMJ on the box. Which stands for full metal jacket. full metal jacket is not the same as complete metal jacket-full metal jacked may or may not have an exposed base, were as a complete metal jacket means the base of the bullet is also incapsulated-as an example, Blazer Brass 115 gr 9mm ammo (which you sell) uses a bullet that is completely enclosed in a metal jacket, base and all. I want to know if the Sellier&Bellot uses the same type of bullet. This is a full metal jacket which means the base is not covered. Sellier & Bellot has a line of covered bases which is call Nontox TFMJ. Typically FMJ has exposed base, TMJ has complete jacket. FMJ nothing exposed. Good clean practice ammo. The ammo has a Full Metal Jacket. Can I use my Palmetto State Armory Gift Card on Daily Deals? Tried this ammo in three Glocks and a Beretta. Functioned fine in all. Average accuracy in three pistols but amazing accuracy in a Glock 17. Ordered another case. Good price, good ammo. I would recommend to anyone. Feeds, fires and ejects in all my 9mm weapons. Good strong ammo...can’t complain. Never had a misfire or a fail to eject. Have used this ammo for years. Never a problem with it. Darn good ammo for the price. It's going bang everytime. No failures. Great ammo! At an awesome price. Clean too! Great and accurate ammo for pistol or carbine. Very clean and reliable ammo. Great go to ammo for all my handguns. This ammo runs fine . Good range ammo. Solid practice ammo at a good price. Reliable as usual. Great price on quality range ammo. I would recommend and buy again. Great ammo not to dirty and no failure to fire out of 400 shot so far. I have fired over five thousand rounds of this grain without a problem. It ran perfectly with my CZ 75 sp01, Ruger 9E, and my Springfield xds 3.3. Great packaging, shipping, product, everything I expect. Ammo worthy of laying in reserve. Great ammo. I have run over 2000 rounds thru my Glock 17 and 43 with no FTF. Very clean accurate ammo. I would recommend and will definitely purchase more when it’s back in stock. When you get sellier and bellot at a deal buy it! I like sellier and bellot a lot. It works every time, it's very clean ammo, and I always have liked their quality, it's top-notch. This is reliable good target ammo 4 range use oh, that's at a fantastic price! S&B is my preferred ammo for range and general use. I have been using it for a number of years in 9mm, 38 special, 45 and 5.56. It is pretty clean and accurate. I prefer it over Winchester white box, blazer, PMC, Magtech, and other general use ammo. Unfortunately, as its popularity has grown over the years it has become more expensive than other general use ammos. Fortunately, I am seeing some very good sales on it lately and I stock up when it does. $7.99 a box on sale is a lot better than the $14.50 cost @ the range! This sale price does not require a rebate as all the Federal ammo has had lately. Prior to taking a four-day pistol course, I tested eleven different brands of 9mm target ammo in my Glock 17. S&B gave me best groups on target, tied with two other brands, at significantly lower cost. Good ammo at a great price. I fired all 1000 rounds of this ammo out of multiple pistols without any issues. S&B is solid Ball Ammo that goes bang every time. It seems to be a little more accurate and consistent than a lot of others. Now part of the CBC group that started as Mag Tech. I haven't done chrono testing on this stuff yet. So not too much as a review. I currently use P320 (3 different ones), M&P 2.0 Compact, CZ P10C. I've never had any problems with Sellier & Bellot ammunition, no misfeeds or stove pipes. As for the accuracy it seems to be good I would say any problems in this area is on my behalf. For the price this ammo is hard to beat, I've used several different calibers of this ammunition and in different brand of firearms as well. As I've already stated I don't recall ever having any problems with this ammo. Its not top of the line like Speer Gold Dot or Hornady but for target ammo its good stuff. Both my S&W 9mm revolvers love this stuff, I loved the price at the time I bought it. 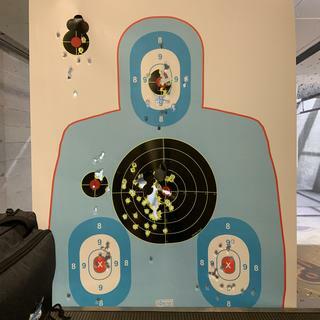 This am I had run well in both short and standard length pistols, and while it has a little larger spread than some of the other 9mm I have used, it is not enough to be concerned about for training ammo. This ammo is very comfortable to shoot compared to the +p and .40S&W rounds that I also use. Great deal at a great price. This was my third purchase from Palmetto States and they have all been great transactions. This ammo performed very well in both HK VP and VPSK pistols, and a Freedom Ordnance FX9. I've had zero FTF, zero FTE and although there was some visual residue, when I worked the slides, it didn't feel grainy, felt very smooth. Something I noticed when reloading, the brass just slid through the resizer die, basically felt no resistance. I'll definitely buy more. Always try to find S&B ammo. It is very clean shooting. Cycles very well. I've been practicing with this ammo for several years - works every time, feeds well, inexpensive - what more can you ask for? It is as expected, seems to function well with no misfires. I have shot quite a little of this over the last couple of years and am a big fan: clean, accurate and inexpensive. After I shoot this 500 rounds, I will re-order. Should of bought more at that price. Will buy more when available. Good range/practice ammo, hotter than most practice ammo, so you have a better feel for how for how your defensive-carry ammo will feel. I have a Franklin Armory BFS3 in my AR-9MM. This ammo ran flawlessly in my AR-9MM with Binary Trigger. I am always looking for the cheapest 9mm ammo to shoot with my Binary trigger. M&P 9mm will eat these all day no issues. On target every round. I've been using this without any problem. It looks very clean However my recent purchase 200 rnds I had several FTF using sig P229. After FTF I load it again and it works. I also used other brand without FTF so I know its not the firing pin or spring. I'd still buy them given that this only happened on this batch. Hope its just a fluke. I bought it 4/2015.